SANIBEL, Fla. -- You wouldn’t think a snail would be so beneficial to the ecosystem. 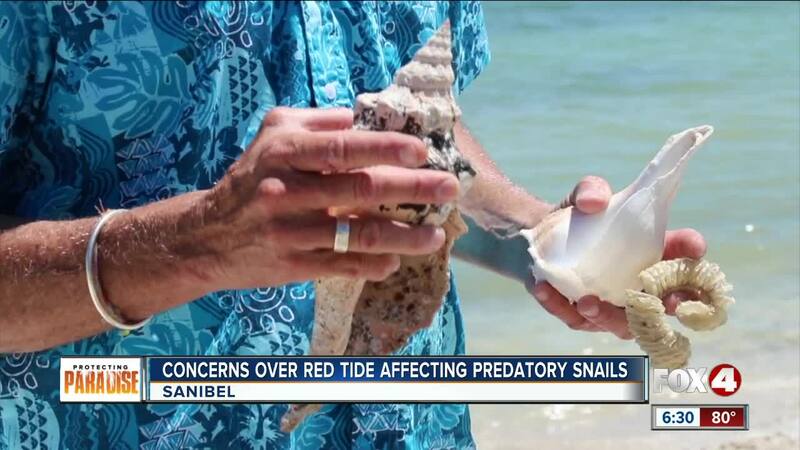 With red tide killing hundreds of wildlife last year, a scientist at Sanibel Sea School, says an animal we don't often think about isn't showing up as often anymore. The lightning whelk, a predatory snail, who's shells are often seen on your beaches. Sanibel sea school, Director, Bruce Neil, tells Fox 4 around November there were more than 10,000 lightning whelk snail eggs on the beach. In March they found zero. Neil says the likely cause is last years red tide. "What that tells us is that we took out all of the sexually reproductive age individuals out of the population or most of them," Neil said. Neil says these snails are unique and important because they help release oxygen from the bottom of the ocean. "Creatures like this, burrowing around crawling through the sand help supply oxygen to the sand so other creatures can grow," Neil said. So with less lightening whelk's Neil says he’s unsure what impact there could be for the local ecosystem or for humans. "It’ll at least be six, seven, eight, ten years before these very important predatory snails come to the populations that we once knew," Neil said.